This gallery has examples of some of our work at the different venues. It can help you visualize the set up of your venue so that we can compliment the decor and yet give you the look of your wedding. Table decor can be very different for every wedding and venue. Centerpieces range in height from low to very tall. Perry Hall Florist carries a large variety of popular glassware that can be rented. Let us help you design a statement that your guests will always remember. 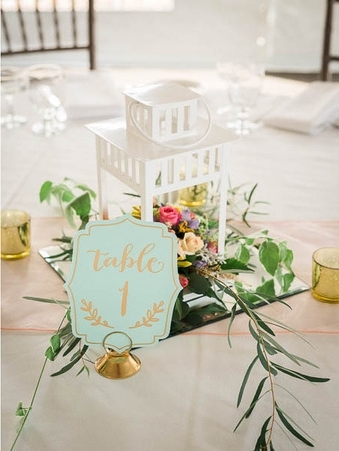 There are many different ideas to display your placecards for your guests. The picture above was for a Baltimore Raven's Themed rection. The goal posts at each end were made of flowers and on the field were the tickets with each guests name. Cake flowers have also become popular and here are a few of the cakes that we have decorated.